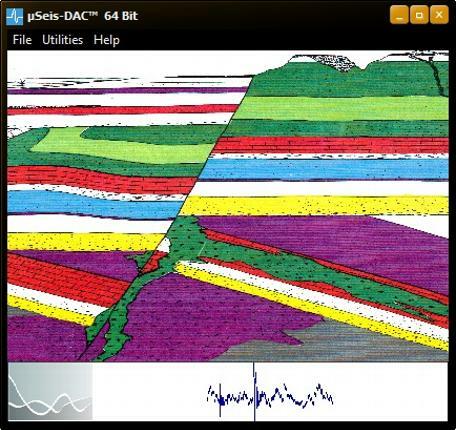 µSeis-DAC™ is a Windows® (32 and 64 bit versions available) program that facilitates the data acquisition of Passive (Micro-)Seismic Monitoring (PSM) time series data utilizing sophisticated signal processing and event detection algorithms. Among engineers there is considerable interest in the real-time identification of “events” within time series data with a low signal to noise ratio (S/N). This is especially true for acoustic emission analysis, which is utilized in the field of PSM. Here an array of seismic receivers are used to acquire acoustic signals to monitor locations where seismic activity is expected: underground excavations, deep open pits and quarries, reservoirs into which fluids are injected or from which fluids are produced, permeable subsurface formations, or sites of large underground explosions. µSeis-DAC™ is based on the so-called SEED™ (Signal Enhancement and Event Detection) algorithm, which uses real time Bayesian Recursive Estimation (BRE) digital filtering techniques to analyze the raw data. The software is customized for specific job applications and client requirements. For example, typically important system considerations consist of number of sensors deployed, type of seismic sensors (accelerometer or geophone), sensitive and bandwidth of sensors, and the area under analysis. Configurable for multi-channel Contact Triggers. Configurable for multi-channel Digital Frequency Filter Triggers. Configurable for multi-channel SEED™ Triggers. P-wave or S-wave short term average / long term average (STA/LTA) event detection. Ability to convert acquired PSM data in SEG-2 format. Ability to convert acquired PSM data in BCE ASCII triaxial format. Display of acquired seismic data with option of applying bandpass, high pass, low pass, and notch digital filters. 1. Baziw, E. and Verbeek, G. (2012), “Passive (Micro-) Seismic Event Detection by Identifying Embedded “event” Anomalies within Statistically Describable Background Noise”, to be published in journal of Pure appl. geophys. 2. Baziw, E., "Real-Time Seismic Signal Enhancement Utilizing a Hybrid Rao-Blackwellised Particle Filter and Hidden Markov Model Filter", IEEE Geosci. Remote Sensing Letters (GRSL), vol. 2, no. 4, pp. 418-422, Oct. 2005. 3. Baziw, E., Nedilko, B, and Weir-Jones, I., "Microseismic Event Detection Kalman Filter: Derivation of the Noise Covariance Matrix and Automated First Break Determination for Accurate Source Location Estimation" , Pure appl. geophys. Vol. 161, Number 2, 303-329. 2004. 4. Baziw, E., and Weir-Jones, I., "Application of Kalman Filtering Techniques for Microseismic Event Detection", Pure appl. geophys. Vol. 159, 449-471. 2002. 5. BCE technical note entitled “Passive (Micro-) Seismic Event Detection by identifying, quantifying and extracting frequency anomalies within statistically describable background noise”. 6. BCE technical note entitled “Relating Peak Particle Velocity and Acceleration to Moment Magnitude in Passive (Micro-) Seismic Monitoring”.